Today it is usually not long before a problem gets expressed as a human rights issue. Indeed, human rights law continues to gain increasing attention internationally, and must move quickly in order to keep up with a social world that changes so rapidly. 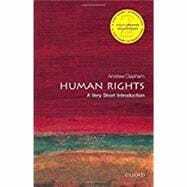 This Very Short Introduction, in its second edition, brings the issue of human rights up to date, considering the current controversies surrounding the movement. Discussing torture and arbitrary detention in the context of counter terrorism, Andrew Clapham also considers new challenges to human rights in the context of privacy, equality and the right to health. Looking at the philosophical justification for rights, the historical origins of human rights and how they are formed in law, Clapham explains what our human rights actually are, what they might be, and where the human rights movement is heading. The Very Short Introductions series from Oxford University Press contains hundreds of titles in almost every subject area. These pocket-sized books are the perfect way to get ahead in a new subject quickly. Our expert authors combine facts, analysis, perspective, new ideas, and enthusiasm to make interesting and challenging topics highly readable. Andrew Clapham is Professor of Public International Law at the Graduate Institute of International Studies, Geneva. Before he joined the Graduate Institute of International Studies Institute in 1997, he was the Representative of Amnesty International to the United Nations in New York. He was the Director of the Geneva Academy of International Humanitarian Law and Human Rights from 2006 until 2014. His publications include The 1949 Geneva Conventions: A Commentary, co-edited with Paola Gaeta and Marco Sassoli, (OUP 2015) and The Oxford Handbook of International Law in Armed Conflict, co-edited with Paola Gaeta (OUP 2014).